Great effort, Sasha. Congratulations. You looked very strong when I saw you on 13th East, though you were so much in the Zone, I'm not sure you even saw or heard anything. Great race Sasha! Nice photo in the DesNews online article. I learn something everytime you run a race just reading the blog. What was the temp at the finish? How do you feel now the day after? What is your total recovery time after a race like that? 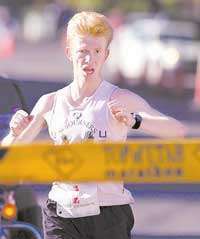 I was happy for you when I read in the paper that you finished 3rd overall and 1st Utahn. Congratulations! Way to go Sasha! First Utah Runner and third overall! Here is a link to the article in the Deseret News Article . You should use the picture from the Deseret News article for your FRB Bio picture. Sasha, great race, congradulations. I am impressed with your ability to run a 5K at race pace on saturday and then turnaround a marathon at a great effort two days later. Sasha - great performance in difficult conditions! Congratulations on a well deserved prize and press coverage :). The picture in the article looks a lot different than the picture you have now on your bio page! You do seem to recover quickly between races as Brent noticed, but I'm wondering if you could have even better results with more tapering? You only seem to taper a week or so before your marathons and then you also throw a 5K race just 2 days before! congrats to you and your great performance. sounded like a pure gut race when it heated up. you battled hard and came out the victor. A nice pay day for your efforts. Thanks everybody for your support. Chad - I did notice you on 13th South. Maria - throwing in a 5 K two days before the marathon did not help, neither did having a baby on Friday. However, there are some things you just have to do - baby-wise, children are a heritage of the Lord, and race-wise I do not like putting all of my eggs into one basket. I discovered through trial and error that a one week taper works very well for me. After that, the gains are marginal, if any, and happen at the cost of losing fitness in the future. Congrats, Sasha, both on the new baby and on the race! Congrats on both baby and race! I figured out last year as well that a one-week taper is quite sufficient, and it shouldn't need to be a big one at that. In 2004 I ran 100-mile weeks all through August and did an abrupt 2-week taper before TOU...and paid for it dearly. Ever since then I just go for one week and keep mileage up by doing doubles. Now that you've achieved your goal of Top 3 and Top Utahn, the only thing left to do is win the race outright!